There are 21 reviews of 1804 George Sand. I did not read any reviews of 1804 so I would not be influenced one way or another. I am fairly new to this and want to develop/hone my frag IQ. I agree with @Bavard that it seems experimental and for me something does not quite work. Maybe the extreme fruit? It seems like an odd combo or mish mash of accords. To be fair, I am not a big fan of fruity or gourmand frags but do appreciative many nonetheless. I might go for a second round in the distant future, but might hesitate. Has a men's after shave / barber shop scent opening. Buzzy, sparkling pineapple, peach, tiare flower notes. Benzoin from the base, is right here on top. Heart is a spicy, floral blend. Rose stands out. Big patchouli note. slight sandalwood. almost a 70's musk note. This a busy fragrance. Rather brash. Very long-lasting. This is an interesting, complex fragrance, bordering on bizarre. The main accord I'm getting from this is typical, classic masculine grooming product, an after shave type smell (which doesn't seem to match the listed notes), and just behind that is a contrasting sweetness that is almost too much and that threatens to ruin it. The is interesting niche perfume: experimental, but wearable. The sandalwood and/or patchouli in the background is nice. It smells like they got their hands on some good stuff. The sweet, fruity stuff, such as the pineapple note, is less refined, and smells gimmicky, but the elements that are good are so good, it mostly works. You're munching on some lukewarm pineapple on a sunny day. You're eating it with your hands and you're getting yourself into a sticky mess when, all of the sudden, a bunch of guests invite themselves over for an afternoon lunch. The men come in wearing various patchouli and woodsy colognes, the women are wearing vanilla and florals, and you're helpless as they all greet you and bombard you with quick hugs while you keep your sticky pineapple hands up in the air. 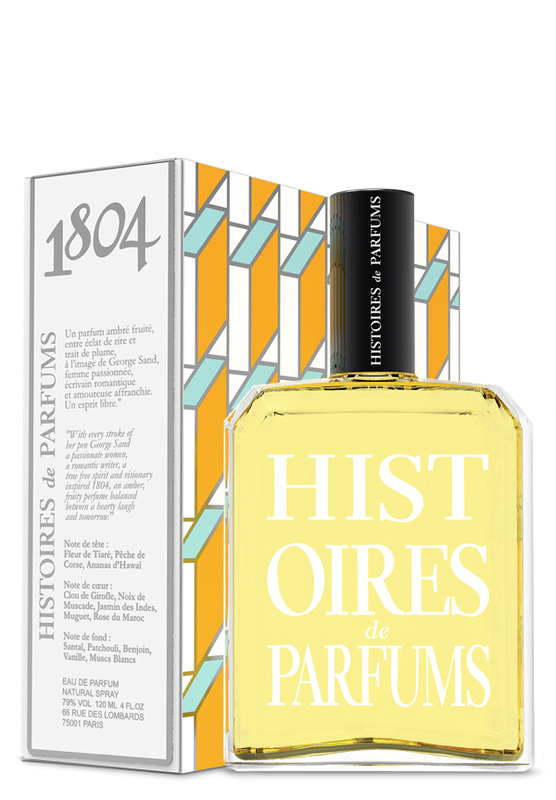 1804 by Histoires de Parfums. I'm giving this a neutral because I only wore it once and maybe I'm not that confident in my own opinion. I got a sharp hairspray sort of synthetic fruitiness that was loud. I will probably revisit this at some point, but I don't imagine that will be any time soon. I was disappointed by this one. I was expecting to smell some sweet pineapple, which I love, from sniffing the bottle cap. But it began with white floral notes and some wood. Almost manly. Then it faded into some average candy smell that I liked better... and it disappeared! There are no member images of 1804 George Sand yet. Why not be the first?